Thank you for joining me as we count down to the next MFT release. We are five days away from the big day! All the new Stamps, Die-namics, and Stencils will be available on Tuesday, March 1 at 10:00 pm EST. Be sure to check out the MFT Blog to see all the new items being revealed today. Don't forget to leave a comment on the MFT Blog countdown posts, YOU could win one of the five $75.00 gift vouchers. I created this bright and sunny card with the new Spring Wreath stamp set and Die-namics. I stamped the wreath in Sour Apple Premium Dye Ink, the flowers were stamped in Daffodil, Lavender Fields, and Wild Wisteria Premium Dye Ink. I stamped the background with the Linen Background stamp, I seriously love that stamp! The fabulous stitched scallop rectangle is one of the dies in the new Blueprints 27 Die-namics. 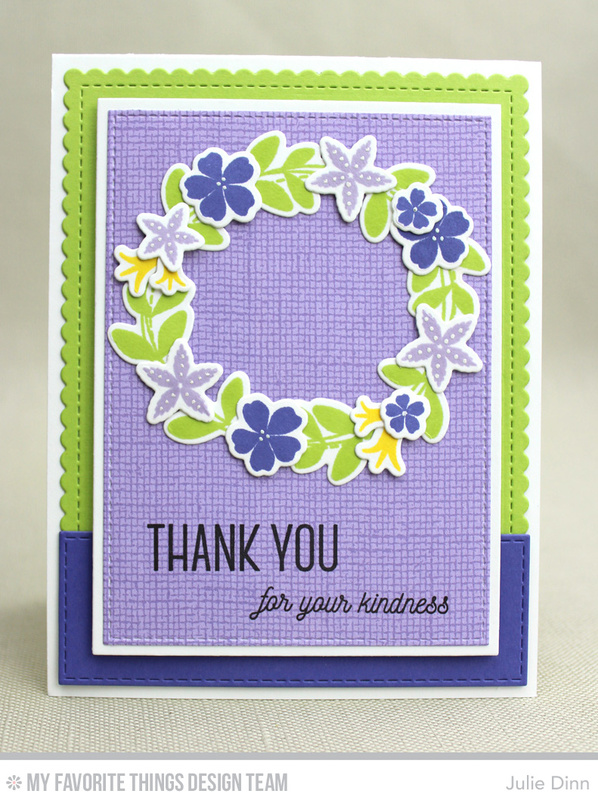 The sentiment is from the new Spring Wreath stamp set. Beautiful color combo, great use of that pretty new wreath stamp and die set! Love MFT Blueprints 27 and how you used to make a beautiful colorful card. Love the colors and the Blueprint die is awesome! the border and background colors really set the wreath off! All the backgrounds are looking lovely with the background stamps!! My Oh My, these are some of my favorite colors to use and you did this card justice. Awesome! Beautiful. Love the linen background. Pretty colors they really make the card pop!! This is a really pretty Spring design. I love the pattern paper used too! What a bold, but beautiful color combo! Great use of the background stamp!!! Absolutely gorgeous! Love the use of Stitched Scalloped Frame die. Oh my word - love these colors together!